For a couple years, I have been following the work of Emily Broad Leib and the Harvard Food Law and Policy Clinic. The clinic has projects related to food access in the Mississippi Delta, school meals programs here in Massachusetts, state laws governing farmers markets, urban food initiatives, and more. Several Friedman School students have been involved at one time or another. The clinic keeps a blog describing activities, internships, and events. For example, one upcoming event will be held jointly with the Friedman School and the Food Sol initiative at Babson College. Community Table is a hub and resource for students pursuing a personal or professional food focus. Conversation will center on what students of food policy, law, nutrition science, technology, business and entrepreneurship are up to in the field and directly support what each is working on (e.g. class, project, internship, job) with ideas, feedback and connections. Community Table is designed to be a relaxed, open brainstorming forum. Format is drop-in, so attendees should feel free to come and go as their calendars permit. Six years after I requested these documents under Freedom of Information Act (FOIA) rules, USDA recently released unredacted copies of documents about a $60 million financial transaction between USDA's National Pork Board (a semi-public "checkoff" program) and the National Pork Producers Council (a pork industry association). The documents reveal the shaky basis for the Pork Board's 2006 purchase of the "Other White Meat" brand from the National Pork Producers Council for $60 million. It looks to me like the sale price was drastically inflated as a way of funneling money from the semi-public checkoff program to the private-sector trade association. Here is how it works. The checkoff program collects more than $40 million each year in mandatory assessments from pork producers -- whether they want to contribute or not -- using the federal government's powers of taxation. Some dissident pork producers object to this tax, but the Department of Justice forces them to pay up. The federal government says that the advertisements serve the public interest and officially are recognized as "government speech." There are rules about how pork checkoff money must be spent. For example, it is not supposed to be used for lobbying. Some pork industry executives wished this restricted money could be transferred to the National Pork Producers Council, which faces fewer rules and is allowed to lobby as much as it likes. In 2006, with USDA approval, the NPPC sold the property rights to the "Other White Meat" brand to the pork checkoff program for $60 million, payable at $3 million per year for 20 years. That year, I asked USDA's Agricultural Marketing Service (AMS) to share the appraisal on which this sale was based. Who said this brand was worth $60 million? Was there any risk that some other entity was going to bid up the price and steal the brand out from under the pork checkoff program? Can you imagine, "Avocados: the Other White Meat"? AMS refused to share the documents. When I filed an administrative appeal, AMS shared only a redacted version, with key passages blacked out. 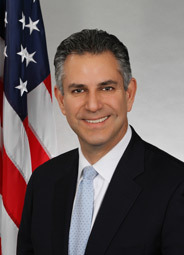 The agency claimed the missing information was "pre-decisional" and "deliberative" and hence not subject to FOIA rules. I always knew this reason was unconvincing, but I never had the money or the stomach to file a lawsuit to press the point. Now, six years later, the documents were released from USDA to the Humane Society of the United States (HSUS), as part of a lawsuit which has also filed a lawsuit challenging the legality of the "Other White Meat" purchase [Note Feb. 26: edited slightly to clarify that the HSUS originally received the documents in a proceeding that was separate from the lawsuit]. The HSUS had become curious about the pork checkoff program, because checkoff funds were being used to criticize the animal welfare society. In the unredacted documents, it seems clear that there is no justification for accepting the $60 million price as legitimate. The pork checkoff program seems to have agreed to an inflated price. The documents claim that it would cost $36 million to rebuild a brand to replace the "Other White Meat" brand over 7 years if the pork checkoff program did not purchase the property. With payments spread over 20 years at a specified interest rate, the total payments would be $60 million. One problem with this computation is that it calculates interest on the payments over 20 years but wrongly treats the $36 million cost as if it happened instantaneously. If one amortized the $36 million cost over 7 years, it would have been much smaller, and hence the total payment over 20 years also would have been much smaller than $60 million. A second problem with this computation is that much of the original equity in the "Other White Meat" brand was built with pork producer checkoff moneys. Asking them to pay again to purchase the brand seems like double-billing. A third problem is that this computation assumes the pork checkoff program was under some real threat of losing the brand. Really, the National Pork Producers Council never had any other buyer. 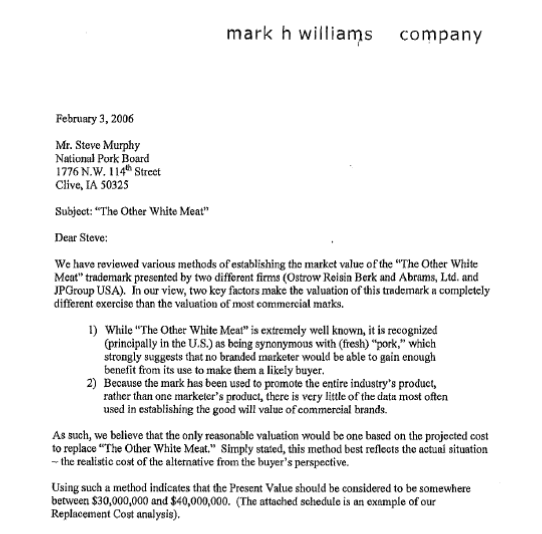 (1) The author is Mark Williams, a long-time insider who had an early role in developing the "Other White Meat" brand. He is not an independent appraiser. (2) There was nothing "pre-decisional" or "deliberative" about the redacted passsage. That was just an excuse to avoid sharing with me the passage that was most embarrassing for the checkoff program. (3) The unredacted passage admits plainly that there never was any other buyer for this brand. 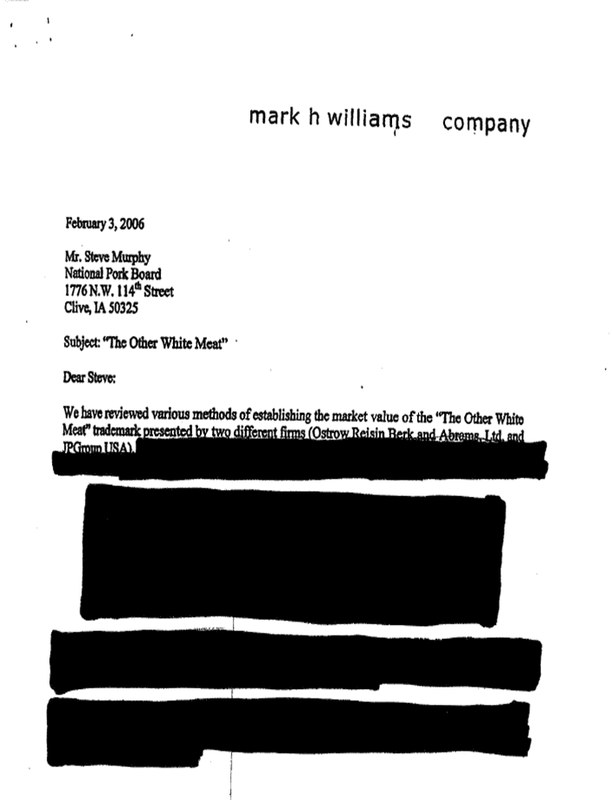 In the formerly blacked out passage, Mark Williams says, "While 'The Other White Meat' is extremely well known, it is recognized (principally in the U.S.) as being synonymous with (fresh) 'pork,' which strongly suggests that no branded marketer would be able to gain enough benefit from its use to make them a likely buyer." That's exactly what I thought in 2006! You can see why the pork checkoff program fought so hard to keep this information secret. The whole purchase seems very wrong to me. I think the hard-working pork producers themselves are being victimized as they are forced to pay up for such nonsense. And I don't think the federal government's semi-public checkoff program should be set loose from the rules that normally circumscribe how checkoff money is used. This sale should be reversed and the ongoing annual payments should be stopped. For local readers, this blog has occasionally covered the work of the East Arlington Livable Streets Coalition, a community group that has been supporting the planned improvements to Massachusetts Avenue through our neighborhood. A critical public meeting will be this Tuesday, Feb. 26, at 7:00 pm at Arlington Town Hall. Please come out to share your views on a healthy transportation plan for all members of the community. It might seem that a bike lane takes space from automobile lanes, but really it is easier for cars when the bikes are not in the car lane. It might seem that wider bus zones would take space from the automobile lane, but really the full-sized bus stops allow buses to pull all the way out of the traffic lane, so they don't have to block cars while letting people embark and disembark. It might seem that 3 auto lanes in place of 4 in some stretches would clog traffic, but really the total automobile traffic volume is regulated by the traffic lights at either end of the neighborhood (at Route 60 and Alewife Brook Parkway), so the extra lane for cars does not really help traffic. Truly the engineers of the redesign have done a terrific job in planning for the needs of pedestrians, bikes, and automobiles all together. They have been highly responsive to public input. The current plan is a good compromise for everybody who uses the avenue. Unfortunately, a Washington DC lobbying group called the American Highway Users Alliance (AHUA) has been helping to generate opposition. They have written an awful misleading letter to the Massachusetts Department of Transportation. Just reading the letter, you can tell they have never even been here, but instead are relying on second hand information from local lawyer Eric Berger, a long-time opponent of the plan. There is a serious risk that a small group of well-funded opponents will be able to divide our community and thwart years of planning with extensive community input. I feel that our community has a big chance to make some improvements that meet our own needs and hopes for our most important street. But we need to turn out to be heard and counted on Feb. 26. The minority student caucus at the University of North Carolina at Chapel Hill yesterday hosted the 34th annual Minority Health Conference. This remarkable student-organized event has a long tradition of presenting research and advocacy on health equity topics. Some speakers and many attendees, including mid-career experts now highly accomplished in health and medical fields, had roots in the programs at UNC and other universities that organized the conference years or even decades earlier. The event was much bigger and more lively than I expected. Highlights this year included keynote talks by Brian Smedley (from the Joint Center for Political and Economic Studies and co-founder of the Opportunity Agenda) and Leandris Liburd (director of the Office of Minority Health and Health Equity at CDC). I enjoyed speaking at a breakout session on food economics. Indeed, food policy issues seemed to arise throughout the conference in conversations and presentations with people from all sorts of health-related fields of study. Here is my top-five list of contemporary board or card games to play with students, colleagues, or friends who have interests in food economics or agricultural economics. Among older games, Monopoly (1933) offers buying and selling, but it misses some of the decision-making tensions that really make economics fascinating as a social science. Monopoly still probably deserves better than its two stars on the Board Game Geek site, which is used throughout this post as a linked source for more information about each game. The old card game Pit (1903) -- also designed in part by George S. Parker -- imitates the raucous sound of an old commodities exchange, but the trading ratios do not really have anything to do with prices that represent resource scarcity. The newer generation of games listed here includes economics themes in imaginative ways. My kids, spouse, and I enjoy the game-play of all five. 5. Roll Through the Ages (2008). This dice game by Matt Leacock is one of the easiest games on the list. Each player gets a score sheet (as in Yahtzee) and a wooden board with pegs (as in cribbage). The goal is to earn points by improving your civilization. If you build more cities, you get to roll more dice. In each turn, you must provide enough food for your cities. With any surplus production, you can develop new technologies (such as irrigation to prevent drought) and build wonders (such as pyramids). Costly early investments generate later advantages. Those who make such investments benefit from a longer game, while those who make fewer early investments benefit from a shorter game, so a lot of strategy depends on actions that can shorten or lengthen the game. Food production is central, and the game illustrates some simple aspects of development economics. 4. Bohnanza (1997). In this card game by the German designer Uwe Rosenberg, you plant cards representing various bean crops in fields on the table in front of you. You earn coins when you harvest the beans. In the game's best agricultural economics feature, you can trade cards with other players who are growing different crops. 3. Agricola (2007). In this elaborate board game, also by Uwe Rosenberg, you start with a wooden hut and try to build up a thriving pre-industrial farmstead. You begin with two family members. Each turn, you send out family members to work at tilling fields, collecting resources, or building things. Every several turns, there is a harvest season, with extra tension as you bring in crops and multiply livestock, trying to ensure enough food for your family. If you raise more family members, you have more laborers but also more mouths to feed. Agricultural economics themes are pervasive. 2. Railways of the World (2005). 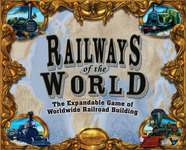 This dramatically over-sized board game by Glenn Drover and Martin Wallace is a spinoff of the old computer game Railway Tycoon. The non-computerized version is terrific. The target audience surely includes old steam train fanatics, who will love the detail about various 19th Century locomotives, but I think the economic history aspects also are very good. For example, in the Eastern United States scenario that comes with the basic set, you make early investments to connect cities. The game cleverly replicates some U.S. economic history, in which short routes between Northeastern cities are central in the early turns, but then a network of links from Chicago becomes crucial later. Small color-coded cubes representing goods are distributed randomly to color-coded cities at the start of the game. You earn points by delivering the goods to similarly-colored cities on the rail links you have built. The best agricultural economics feature arises from the natural way that the presence of pent up supply of a good in one place, combined with unsatisfied demand for the good in a city elsewhere, generates a great incentive to invest heavily in a rail link between the two locations. There is an astutely designed system for taking out bonds to fund early investments, but each bond requires later interest payments. 1. 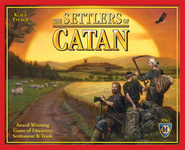 Settlers of Catan (1995). This game by Klaus Teuber is one of the most popular in the past quarter century of innovative European board games. You build settlements and roads on an island with three or four other players. The board itself is composed of randomly distributed hexagons, so it is different each time you play. Each settlement entitles you to resources from surrounding hexagons. Different resources -- clay, wheat, sheep, ore, and lumber -- are used in various combinations to build new settlements, upgrade settlements to cities, or support armies to attack your neighbors. The game earns the number one spot here, because it succeeds more than any other game I know in imitating some key insights about pricing in real-world economic markets. Players trade resources with each other at prices they determine themselves. For good players, the prices adapt to random changes in the relative scarcity of the various resources. This pricing system works itself out naturally, and doesn't get in the way of the game play, which is plenty entertaining. Senate Agriculture Committee hearing on "Drought, Fire, and Freeze"
The Senate Agriculture Committee yesterday held a hearing on disasters and agriculture policy. The slew of disasters in the last year are related both to crop insurance issues and environmental constraints on food production. The hearing website includes video and testimony from USDA chief economist Joe Glauber, NOAA director Roger Pulwarty, and several farmers and ranchers. 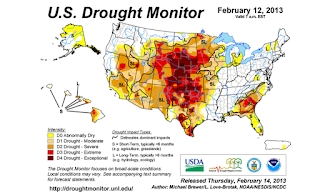 There is good related news and commentary from the National Sustainable Agriculture Coalition (NSAC), AgriPulse, and Keith Good. The witnesses discussed a variety of conservation programs including the Conservation Stewardship Program (CSP), Environmental Quality Incentives Program (EQIP), and Farm and Ranch Land Protection Program (FRPP). Ben Steffen, the diversified crop-livestock producer from Nebraska, noted that his CSP contract has been instrumental in helping him change his tillage practices and establish cover crops on his land. His extensive cover cropping has helped retain moisture and soil throughout the ongoing drought. The producers from Michigan, Indiana, and Montana each noted specific conservation practices, such as no-till, cover cropping, buffer strips, and irrigation improvements that built resiliency into their operations and helped them respond to droughts, floods, freezes. The AGree agricultural policy initiative, which has been working for a couple years to bring together a diverse group of food policy stakeholders, recently began posting position papers to its website. For example, one position paper addresses policies to Increase Agricultural Productivity by Conserving and Enhancing Soil, Water, and Habitat. In my view, the position paper reflects common-sense mainstream views about the need to protect the environment. Yet, U.S. food policy has become sufficiently fractured, and some producer organizations are sufficiently concerned about regulatory overreach, that it requires some courage and compromise for AGree just to state these positions. Investments in farm bill conservation programs; these programs should target durable environmental quality improvements across the landscape and leverage the investments of producers and other partners. Investments in the scientific, research, and extension infrastructure that support agriculture; indeed, strengthening this critical infrastructure will be necessary to successfully meet the challenges the U.S. faces over the long term. I work on AGree's Research Committee, which provides research support services to the more important Advisory Committee. The Advisory Committee oversees the policy positions. AGree is funded by several major foundations. Of course, AGree is not responsible for anything said on this blog, nor am I asked to endorse everything AGree does. I will say that I think it is great to bring together such a group of stakeholders to talk and get to know each other, perhaps eventually overcoming some divisions and mistrust. Such an effort could lead to policy recommendations worth listening to. Here’s how it works: insurance policyholders read about member farms on the Coalition’s website, all of which are certified organic or have exempt status. They then contact a farmer directly to sign up and pay up front for the share, as with any traditional CSA. Finally, they fill out their respective health plan’s CSA rebate form (available online) and mail/fax it to the health plan with proof of payment and a copy of their sign-up form. A few weeks later, policyholders receive a reimbursement check for up to $100 for an individual contract or $200 for a family contract. The FairShare partnership has been wildly successful. The Consumer Federation of America's National Food Policy Conference is an always-fascinating annual tradition. For 36 years, the National Food Policy Conference has been a Washington institution and a unique collaboration between consumer advocates, the food industry and government. The conference is organized by the Consumer Federation of America and is a key national gathering for those interested in agriculture, food and nutrition policy. This year’s conference will explore an array of important food policy issues facing consumers and the food industry. The conference will explore how immigration reform might impact our food supply and discuss the future of food shopping. Speakers and panelists will examine timely food policy topics including the debate on sugar sweetened beverages, the impact of changing animal welfare standards, an update on implementation of the Food Safety Modernization Act, the opportunities and challenges of sodium reduction, and priority setting in a time of reduced resources. Register today using the registration tab. Reduced registration fees are available for college and graduate students. Check back here for the latest conference updates and information.Follow us on Twitter and join the conversation at #FPC2013. A few years ago, I enjoyed participating in a debate about agricultural subsidies at this event, as part of a panel including former U.S. Rep. Charlie Stenholm, the Environmental Working Group's Ken Cook, and Bread for the World's David Beckmann, and hosted by NPR's Dan Charles. Are you outraged by what’s marketed to children these days—junk toys, junk food, violent media, sexualized clothing? Do you believe it’s wrong that corporations have so much influence on children’s lives? Do you think children need more play time and less screen time? Do you want to do something about it? Come to CCFC’s 8th annual Consuming Kids Summit in Boston on March 21-23. Learn. Network. Meet and mingle with today’s leading scholars, activists, and researchers—and people like you who believe that children should be nurtured, not manipulated for profit. Find out what you can do to stop the commercial exploitation of children. This year’s summit features an amazing array of speakers, including many—like advertising legend Alex Bogusky, the Praxis Project’s Makani Themba, and Melissa Wardy of Pigtail Pals and Ballcap Buddies—who will be presenting for the first time at a CCFC summit. We’re also thrilled to welcome back old friends like Tim Kasser, Nancy Carlsson-Paige, Diane Levin, and Michele Simon. Click here to learn more about our presenters and then don’t forget to register! Ethan Bergman, president of the Academy of Nutrition and Dietetics (AND), responded in a press release on Jan. 23 to Michele Simon's critical report about corporate sponsorship at the national dietetics group (which U.S. Food Policy covered last week). Each year, the Academy utilizes Performance Research, an independent, third-party research company, to examine a random selection of members that is a statistically sound representation of the Academy membership as a whole. The results from these representative surveys have shown an increased awareness and continued support of the sponsorship program. I apologize, but we do not share the survey or its results with outside professionals. I appreciate your interest in the issue, especially with regard to your students, and apologize for the inconvenience. The response is polite and professional, but it still seems to me quite unsatisfactory. If the Performance Research survey is so reassuring and statistically sound, it seems quite odd not to share it with the public. Also this week, because this debate heightens people's awareness that funding sources are connected to the perceived credibility of public interest research and writing, I asked Michele Simon who funded her report. She responded that, at the request of the funder, she could not disclose this information. I feel considerable admiration for all people trying to make a living doing good work in the public interest. Each in their own way, Michele Simon and AND make hard choices about research funding in order to make possible the work they do to promote a healthier and more nutritious food system. Still, let me speak up in favor of more disclosure all around. The public is not stupid. We can handle this information without overreacting. Agriculture Secretary Tom Vilsack on Feb. 2 announced a new agreement with Mexico, under which Mexico's tomato exports must satisfy a minimum price. In adopting a moderately protectionist policy by mutual agreement, the two countries avoid a trade conflict that could have harmed their commerce more seriously. "I applaud the good work of Undersecretary Sánchez and the Commerce Department to forge this important agreement to allow our domestic tomato industry to compete on a level playing field. The draft agreement meets the requirements of U.S. antidumping law and provides an effective remedy for our domestic tomato producers, further bolstering agriculture as a bright spot in our nation's economy. Ultimately, the Obama Administration forged an agreement that will restore stability and confidence to the U.S. tomato market and ensure fair trade in fresh tomatoes through increased reference prices, coverage and strengthened enforcement. The United States is one of the world's leading producers of tasty, high-quality tomatoes. Our U.S. fresh and processed tomatoes account for more than $2 billion in cash receipts and support thousands of American jobs in our food industry, shipping, processing and more." The U.S. Food Policy blog recently discussed how agricultural labor markets in Mexico and the United States are interconnected. If it is true that agricultural wages in Mexico are rising, it becomes easier for Mexico to agree to a price floor for Mexican tomato exports, addressing multiple problems simultaneously. In a 2010 article for the Journal of Agricultural and Resource Economics (may be gated), Friedman School graduate student Wendy Johnecheck, Julie Caswell, and I studied the possible impact of hypothetical country-of-origin labeling (COOL) regulations on the U.S.-Mexican trade in tomatoes. In my class on U.S. food policy, we explore (a) some occasions when import-competing businesses (such as U.S. tomato growers) have convinced the government to put up protective barriers and (b) other occasions when such barriers have been resisted by advocacy coalitions led by import buyers (such as major retail chains) and other U.S. agricultural industries that rely on exports (such as wheat producers). These U.S. advocacy coalitions are politically important, because, of course, Mexican producer groups have no direct representation in the U.S. Congress. The Mexicans enlisted roughly 370 American businesses, including Wal-Mart Stores and meat and vegetable producers, to argue their cause. Those businesses feared a bitter trade war like the one the Mexicans waged over trucking, which imposed stiff tariffs on American goods headed south. Should dietary guidance advice encompass environmental issues? The federal government's Dietary Guidelines for Americans document does address some issues beyond just diet, including both physical activity and food safety. For a number of reasons, environmental issues are not yet included. But several interesting efforts have gone further. A classic source is the 1986 article "Dietary Guidelines for Sustainability," by Joan Dye Gussow and Kate Clancy (may be gated). One more recent resource, which incorporates environmental issues into a dietary guidance graphic akin to MyPyramid or MyPlate is the Barilla Double Pyramid: "Good for you, sustainable for the planet." Another resource, from Fall 2012, is the "Good Food on a Tight Budget" guidance from the Environmental Working Group. 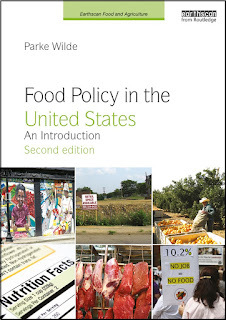 In this video, EWG's Dawn Undurraga -- a Friedman School alum and former U.S. food policy student -- explains how the guide combines both diet and nutrition issues. The most droll line in the video comes from a chef, who said (unless I misheard it! ): "Income is not consistent with my life right now." The "competitive foods" served in vending machines and snack bars outside of the federal school meals programs strongly affect both the economic viability of these programs and healthfulness of the nutrition environment for U.S. children. I suspect that having strong rules to rein in competitive foods may actually strengthen the hand of school food service directors who want to make a healthy meals program economically sustainable. 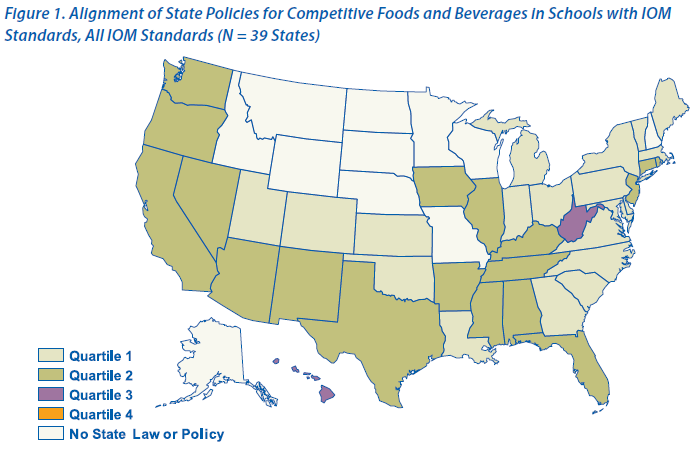 The Centers for Disease Control and Prevention (CDC) recently posted a new report (.pdf) summarizing state policies regarding "competitive foods" outside of the federal school meals programs. One nice surprise is the states that appeared to have the strongest rules. Hawaii and West Virginia were ranked by the CDC in the "third quartile" of adherence to nutrition policy standards; no states ranked in the "fourth quartile." (I'll ask my statistics class this week whether there might have been a better word than "quartile" for this particular ranking method). The CDC website has all sorts of great resources for people who want to get involved in encouraging good policies in their own states and communities. The proposed regulations will be open to public comment for 60 days. I look forward to reading them, but also will be glad for your suggestions about which sections seem most interesting.